If you have recently received a diagnosis of Meniere’s disease and are doing some research to learn more about your condition, that is commendable. However, please take the proper precautions to ensure that the information you are being provided is accurate. We’re going to correct a bunch of misinformation regarding Meniere’s disease that we have discovered while researching articles for this website. After debunking the myths, we will share with you some information regarding a natural way that hundreds of patients have found significant relief in case studies. Misinformation: Meniere’s disease is the same as endolymphatic hydrops. – Correction: Meniere’s disease is a vestibular syndrome that presents with vertigo, tinnitus, hearing loss, and a feeling of fullness in the ear. Some of these symptoms flare up when the patient experiences endolymphatic hydrops, a technical term for when there is too much fluid in the ears. Some sites refer to Meniere’s disease as idiopathic endolymphatic hydrops. Basically, that means there is too much fluid in the ear with no known underlying cause (that’s what the idiopathic part means), but that makes even less sense. If you are blaming the fluid on Meniere’s, then how could it be idiopathic? Misinformation: The average onset of Meniere’s occurs between ages 40 and 60. – Correction: Most diagnoses take place between ages 20 and 60, so don’t write off the possibility of Meniere’s because you haven’t reached middle age yet. The average onset of Meniere’s disease is in a person’s 40s. It is also important to note that occurrence is roughly equal regardless of gender. Misinformation: About 2% of the population (or 2 out of 100) have Meniere’s disease. – Correction: About 0.2% of the population (or 2 out of 1,000) have Meniere’s disease. This misinformation was published by US News and World Report. It looks like just a bit of bad math, and technically the article was still accurate because it said, “less than 2 percent,” and 0.2% is definitely less than 2%. It is still surprising that it got by the editor of a major news source. According to the most recent report (which is actually about 5 years old), there are approximately 615,000 cases in the US. Misinformation: Only about 10-15% of Meniere’s patients will end up with bilateralism (the disease affecting both ears). – Correction: It could be as much as 50% of patients who will end up with bilateral Meniere’s. The key to stopping this process seems to be receiving proper care since it can take up to 30 years for bilateral symptoms to appear. On the other hand, the low jeopardy of bilateralism is sometimes used to convince a patient to engage in risky treatment, such as surgeries that involve severing the vestibular nerve on one side or potentially losing hearing in one ear from injections. Understanding the increased risk of developing the condition in the other ear may cause patients to second-guess such drastic measures. 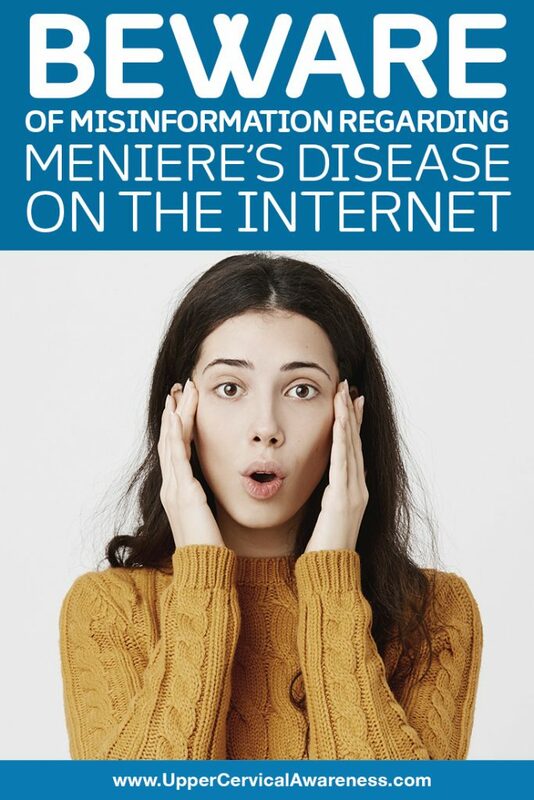 This is just a sampling of some of the things we found online that needed a little correction to help our readers to understand Meniere’s disease better. Another common misunderstanding is that there is no alternative to injections and surgeries. We’re going to correct that misunderstanding as well by introducing you to upper cervical chiropractic care. Ear Drainage – The atlas (C1) is positioned directly between the ears. A slight misalignment can cause gradual changes to the function of the Eustachian tubes, which draw fluid away from the ears. This, in turn, can result in endolymphatic hydrops and vertigo. Interestingly, much research regarding upper cervical chiropractic and Meniere’s involves the theory that untreated whiplash could gradually cause a lesion on the Eustachian tubes over the course of about 15 years. Researchers were able to help 97% of patients with Meniere’s and an upper cervical misalignment to achieve an average of over 90% reduction in vertigo severity. Brainstem Function – The atlas surrounds the very sensitive part of the central nervous system where the brainstem meets the spinal cord. Even the slightest misalignment can turn this bone from a protector of the brainstem into a stressor. Correcting the misalignment is vital for maintaining proper brainstem function. Blood Flow – The upper cervical spine facilitates blood flow to the brain, so once again, it becomes clear that proper alignment is necessary for good central nervous system function. Lack of oxygen may potentially lead to misunderstood signals from the ears regarding balance and spatial orientation, among other things. If you are suffering from Meniere’s disease and you are looking for a natural way to find some relief, this may be the alternative therapy for you. We especially find that patients with a history of head or neck trauma are good candidates for successful care. If you would like to learn more, schedule a consultation with the practitioner in your area. You can use the search function on this website to find a chiropractor who specializes in upper cervical. This may be your first step toward experiencing significant health benefits.